Mexican is my absolute favourite type of food but it’s so rare to find a restaurant that does it well. Too often it’s greasy, heavy and tastes ‘out of a packet/jar’, so having Pinche Pinche 5 mins away from me is a god send. I won’t go on too much (you can read for yourself here and here) but every time I’ve visited the food has been zingy, fresh and authentic. When the owner, Simon, invited me down to try the new menu I was all kinds of excited! Me and P jumped in a cab and headed over to Chapel Allerton last Saturday evening to try a few of the dishes. When we arrived it was buzzing with lots of friends and couples enjoying dinner, every time I’ve ever visited it’s always busy so don’t expect a walk in at the weekend. Instead of choosing ourselves we were asked if we’d like the chef to send plates out, we said yes as we figured this way we’d end up trying some dishes we’d never normally pick. We talked through what we really liked and what we didn’t like (bell peppers for me), the chef even sent out some pimento to make sure I’d like it! 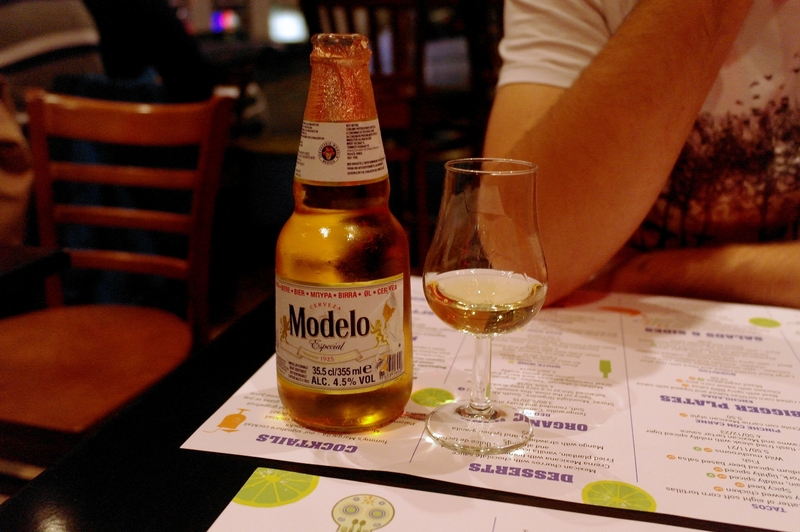 To drink P had a bottle of Modelo (£4.35) and a tequila (I’m afraid I can’t remember which, they range from about £3.50-£5.70) and I had the Homemade Hibiscus Drink (£2). Sadly I’m currently off the booze so couldn’t indulge in any of their cocktails. 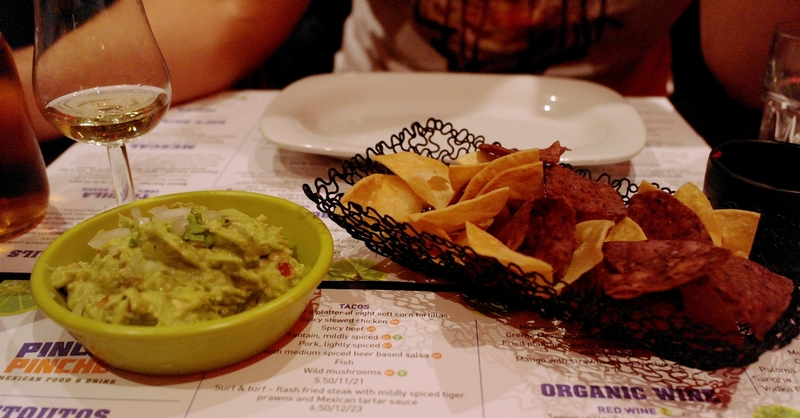 One of my favs at Pinche Pinche is the Guacamole and Chips, a big old mountain of zingy guacamole (£4.50 for one or £7.50 for two) with authentic corn chips. 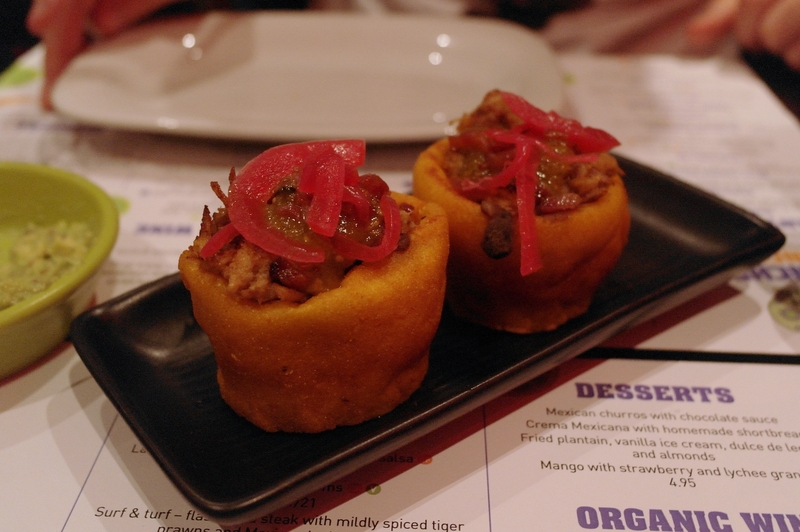 Then a couple of dishes that I probably wouldn’t have ordered myself; Sweet Sticky Pork Sopes (£6) and Prawn & Cod Ceviche (£5.25). I’ve never heard of sopes before but was very pleasantly surprised. Sweet, tender pork in a thick maize and sweet potato case. Very delicious however very filling! 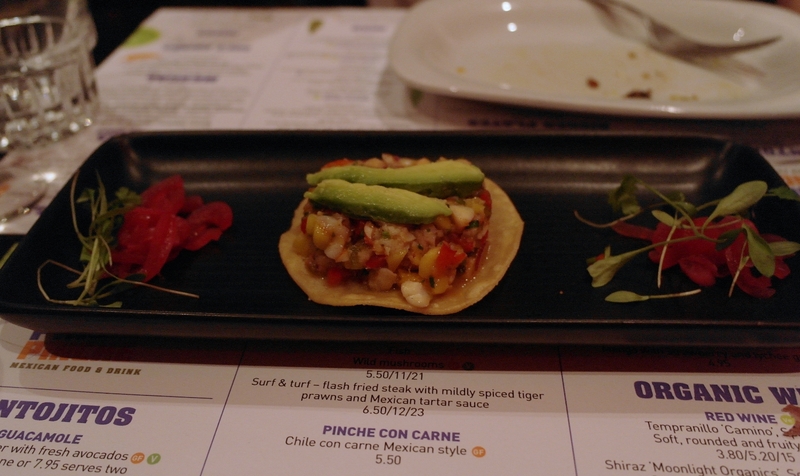 The ceviche was fresh and cut through the richness of the previous sopes. 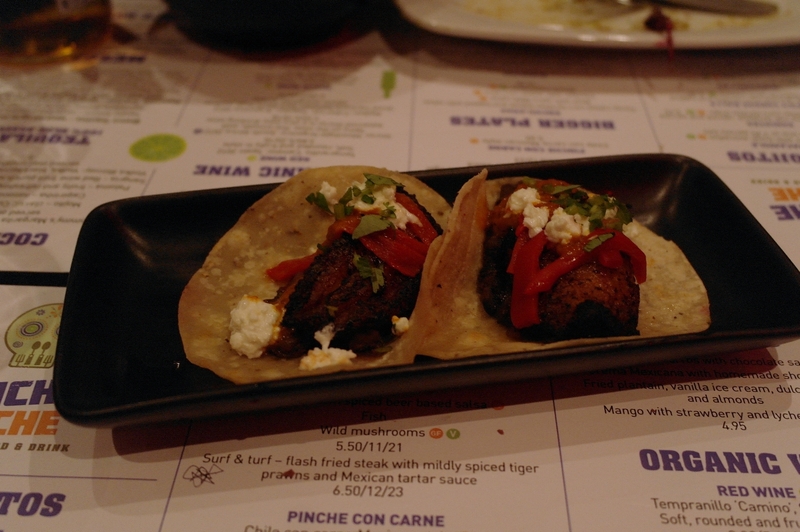 Next up we had the Surf & Turf Tacos (£6.50), Marinated Lamb with Oaxacan Cheese Quesadilla (£6.50) and the Slow Cooked Lamb Sopes (£6). 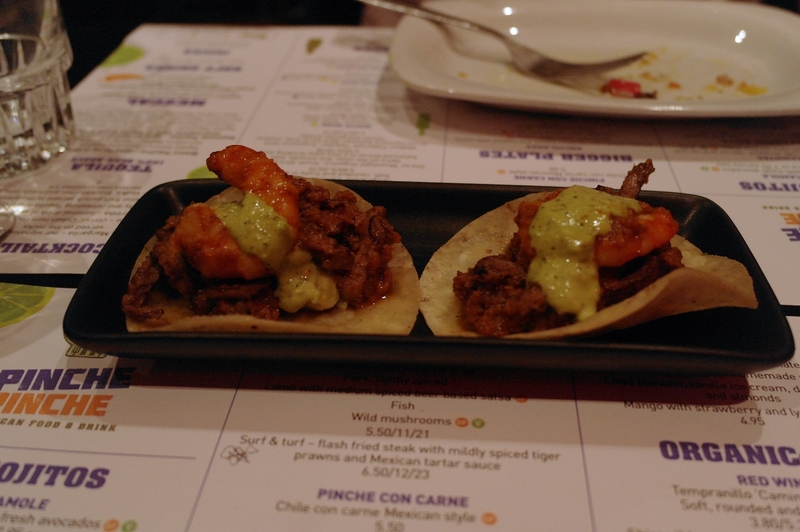 The Surf & Turf Tacos were again something we probably never would have ordered but were one of my favourites we tried. The prawn was juicy and well cooked, the steak was tender and had a nice kick of spice and it was served with a tasty Mexican tartar sauce. 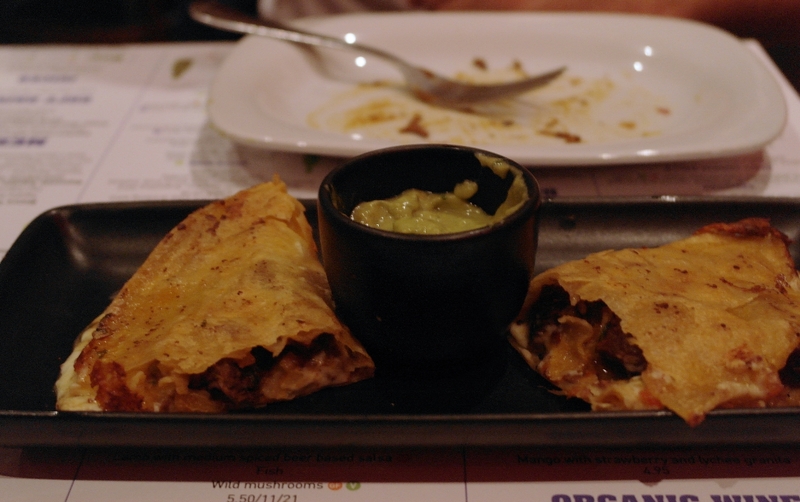 The quesadilla was packed with a rich lamb/cheese combo and had a crispy corn tortilla. 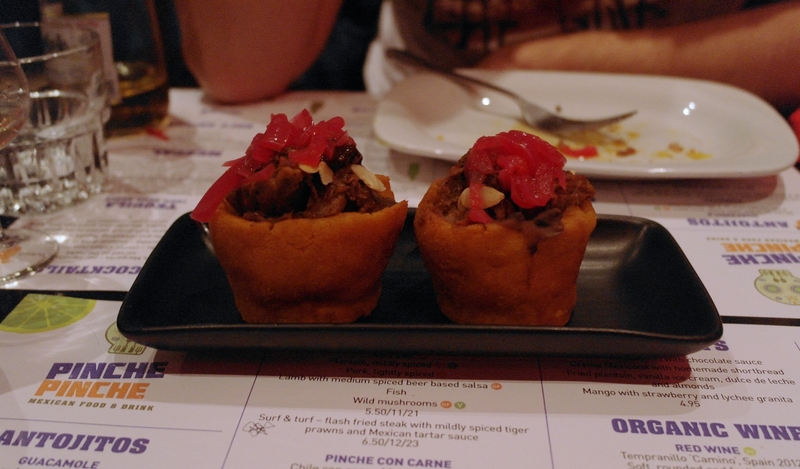 The sopes were filled with melt in the mouth lamb, however as I’d previously said, very filling so I wouldn’t recommend eating more than 1! After this we had Plantain Empanada (£4.95) and Sweet Potato Fries (£2.50). 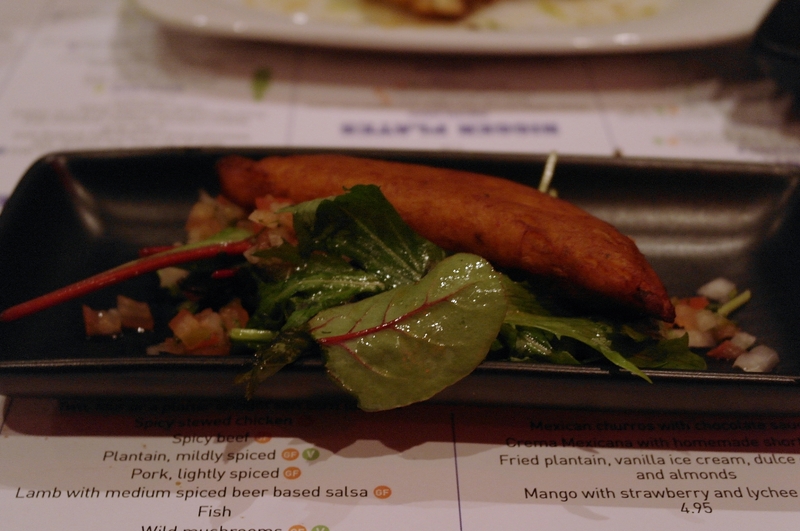 The Empanda was a pasty (though the casing was very light) filled with plantain, goats cheese and black beans. I love goats cheese and it added a nice tang to the dish. 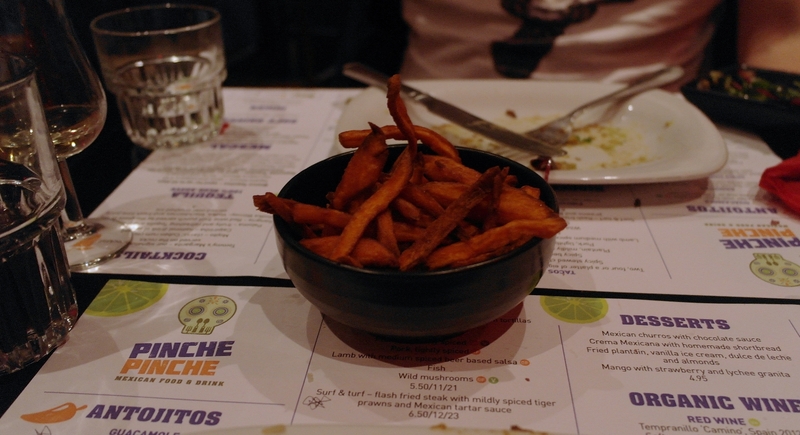 The Sweet Potato Fries were probably the most surprising of the evening. I’m very ‘meh’ about sweet potato, especially fries, I don’t see what the fuss is about. These were great though, crispy and hot out the fryer. Even though we were on our 8th plate we still managed to make a decent dent in them! By this point we were getting pretty full, really I’d say order around 3 dishes each (and maybe some guc and chips to share) however they kept on coming out! Like I said the chef was very enthusiastic but it was great fun to be able to try more. 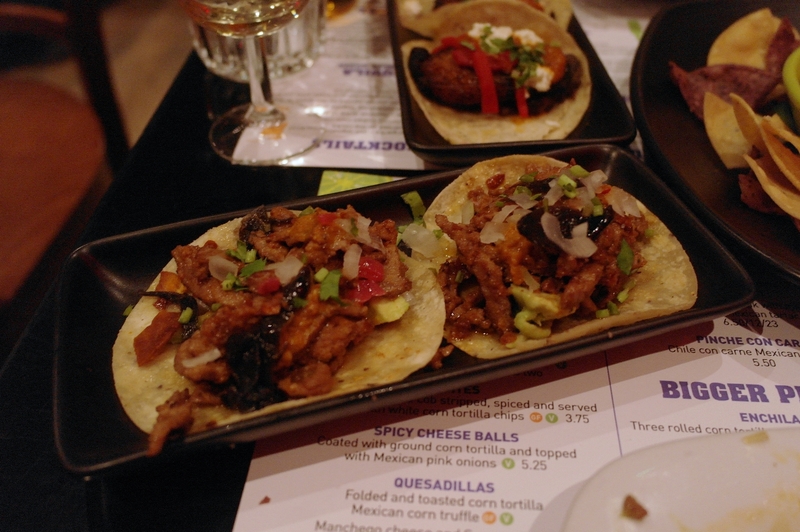 Onto more tacos – Plantain (£5.50), Spicy Stewed Chicken (£5.50) and Lamb with Beer Based Salsa (£5.50) this time! The spicy chicken was a particular favourite, lots of flavour with just the right amount of heat. And finally (!) 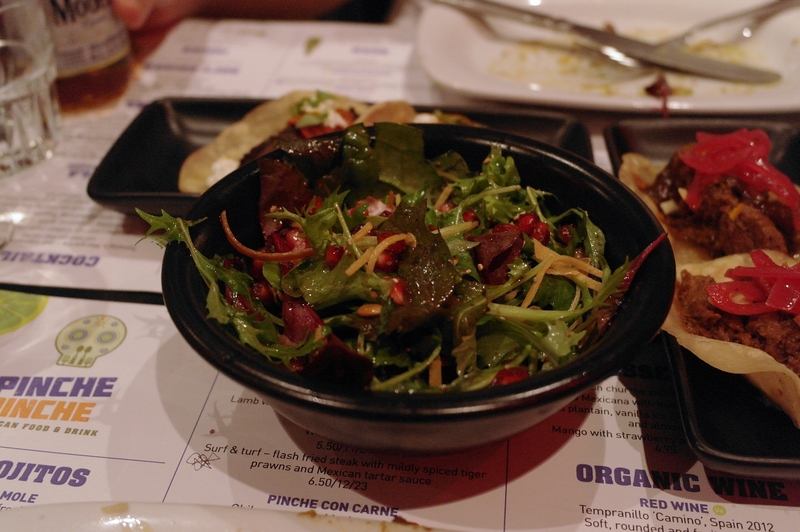 we finished on the Pomegranate and Ranchero Cheese Salad (£4.25) and the Esquites (£3.75). The salad was so tasty and added a nice palette cleanser in between dishes, I’d definitely order one of them again to offset all the other rich food. The esquites was an interesting one. 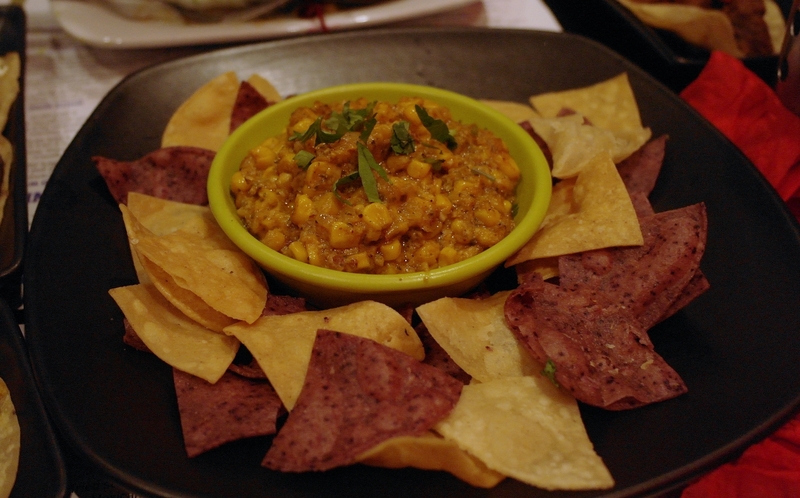 Corn stripped off the cob then spiced served with corn chips. I’ve not ever seen this before so was really intrigued when it turned up on the table, although very good, I think I’m more of a guc and chips kinda gal. So there we have it, all 13 dishes – we had a good try of the whole menu! I can also happily say I enjoyed everything we had. 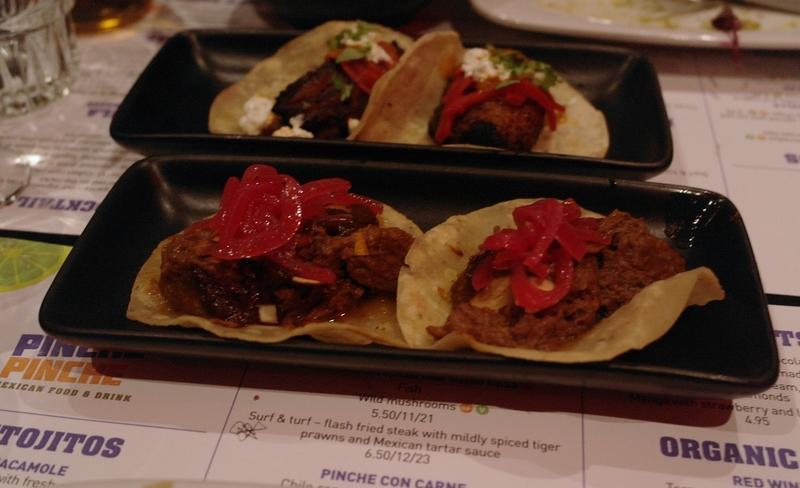 Some of the bigger dishes (like fajitas etc) have been taken off the menu and Pinche Pinche have moved more towards little tapas style servings but I prefer that style of eating anyway. We obviously didn’t have room for pudding but having had their Churros previously I would say order these, I’d also be intrigued to try the Fried Plantain with Dulce de Leche (£4.95) and Mango with Strawberry and Lychee Granita (£4.95). Pinche Pinche still remains one of my favourite restaurants in Leeds. Not only are the staff lovely (they really are by the way) but the booze and food is great. It’s got such a lovely laid back atmosphere, the perfect place to spend a Saturday evening. This meal was complimentary, views are my own though.